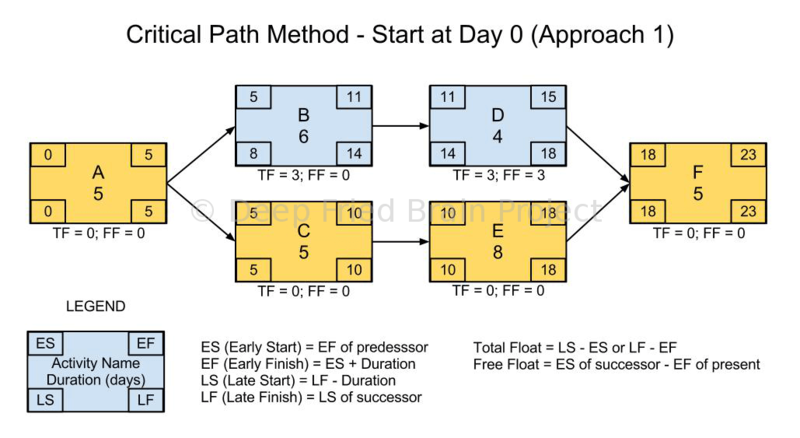 Critical Path calculation can start at Day Zero (0) or Day One (1). 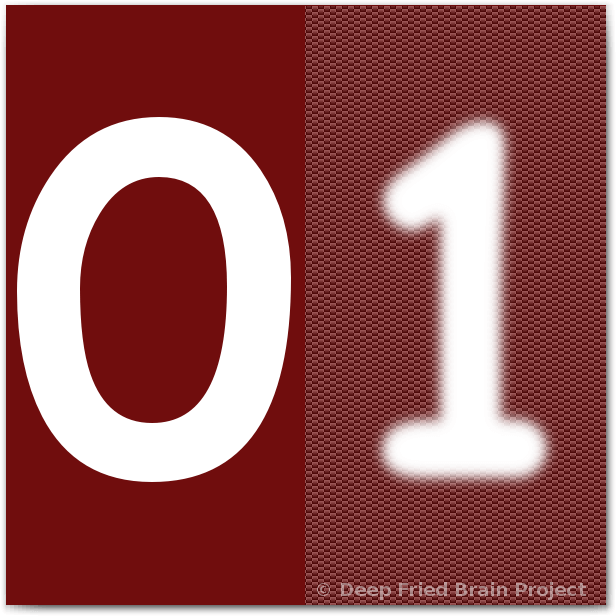 One of the most frequently asked and hotly debated topics about Critical Path calculation by PMP aspirants is whether to start the forward pass calculation at Day 0 or 1. This has been a topic of debate on numerous forums and blogs, including this blog. But I’ve not seen a conclusive answer anywhere. The PMP exam prep guides and courses add to the confusion by following different approaches. Some authors prefer to start at zero, some start at one. Each approach yields different results. What is the Correct Approach for the PMP Exam? While practically speaking, it may be a matter of choice, but from the exam point of view, there’s only one correct approach. So, what is that correct approach? Should we start the forward pass calculation at Day zero or Day one? Today I’m going to answer that question for you, support it with evidence and put an end to this debate. So, are we ready to dive in? First, let’s consider a simple example and see how the results differ when we follow one approach over the other. Refer to figure 1 and 2. In figure 1, we started with zero and performed the forward and backward pass calculations. In figure 2, we started with one. Refer to the post Total Float vs Free Float for float formulas and calculations shown in the above examples. In both the cases, the Critical Path duration and float calculations yield the same result. The formulas to calculate the ES, EF, LS, LF, and FF are different. For calculating the duration of critical path and float, it doesn’t matter which approach you take as long as you use the right formula. The values of ES, EF, LS and LF are different in the two approaches. The formulas and calculations are relatively simpler in approach 1 (but your preference may be different). Let’s look at the approach that some of the popular study guides and . Rita Mulcahy’s PMP Exam Prep uses approach 1, whereas Head First PMP and PM Prepcast use approach 2. There are some books that completely avoid both approaches and use a calendar date as the start date. So, the (million-dollar) question is, which approach is right from the PMP exam point of view? Which approach should I use in the PMP exam? Update 04 March 2017: This article was first posted about 5 years ago (Mar 2012). Based on the feedback in the comments and other changes that have happened since then, I’m updating this post. There’s no official word from PMI as to what the correct approach is. If I have to pick one of the two approaches at this point, I would go with Approach 2 as that’s what is used in the PMBOK® Guide, 5th Edition. For the PMP exam, Approach 2 - Start at Day 1 is the correct approach. If you have questions or comments, please feel free to post them below. I’m always eager to read your comments. While we are here, I also want to invite you to join my new forum PM Hangout. All I’ll say is if you love this blog, you’ll love the forum too. So, what are you waiting for? This was precisely the debate that was ensuing hotly in the PMP bootcamp batch I am participating in my local city. The trainer was using the HeadFirstPMP book as one of the training materials and it uses the Approach 2 (forward pass - start at one), whereas she was insisting that according to her own experiences with the PMP exam and feedback from previous PMP bootcamp candidates, the correct answer is Approach 1 (forward pass - start at zero). Thus, the confusion arose and a lively debate ensued, with everyone voicing their favorite book's recommended strategy. Thank you so much for shedding the perfect light on this very critical subject and confirming it with that PMI post link, now I can't wait to share this tidbit with my batchmates tomorrow. To make a long story short, the clock starting with zero is the mathematical method used by ADM (Activity Diagramming Method)while the clock starting from 1 is used by PDM (Precedence Diagramming Method). Given that only one major software package uses ADM (Microplanner) and the last time I used it commercially was back in 1983, pretty much tells the story. If you look at MS Project, Primavera and all the major software tools in use today they all use PDM. Some time ago, PMI rationally and logically dropped ADM in favor of PDM meaning when you start calculating float, start with 1, not 0. Actually I don't claim to know the 'right' answer. Neither did I attempt to say that one approach is better than the other. I mainly use MS Project, and it start with 1 (Approach 2). I've only attempted to answer the question, "Which approach is right from the PMP exam point of view?" My answer is based on an article in PMI Community Post. If Barbee Davis, MA, PHR, PMP is wrong, then I'm wrong too. If you have more reliable information (on which approach to follow for the exam), then please share with us. I'll be happy to update the original post. P.S. : Mr. Oliver F. Lehmann, PMP was also very critical of my article, when I posted a link on Google Plus. I actually see it positively. This blog is not just a mean for sharing information, but also for me to learn from others. So, please keep your feedback coming. I welcome all constructive feedback. New Look of your blog is awesome. Thanks Fahad, it was overdue for a year, and finally I found some time to work on it. Apart from the aesthetics, I've tried to improve the page load time. The pages load at least 2x faster now, and there's still scope for improvement. PS: Yes, I too like the new look of your blog!! Nice work!! In case of "Free Float" calculating, it will give different result if you start with 1 than 0. Anyway, my understanding is that starting with 1 is more realistic as first date cannot be 0 (keeping in mind calender date). Otherwise it's fine using any of them. Can you explain how you get different values in Free Float calculation? The formula for Free Float is different in the two approaches. If the correct formula is applied, the same result would be the same. Yes, you are correct. My comments are wrong as I misunderstood it. You can delete my comments as it may lead to confusion to others. In the "old days" PMI used both ADM (clock starts running at time 0) and PDM (clock starts running on the morning of day 1) but starting with the PMBOK Guide 3rd Edition, PMI dropped ADM and from that point forward, all the calculations started using PDM, meaning the clock starts running on the morning of day 1. Put it this way- this is the method I teach in my classes and we have close to a 20 year running first attempt pass rate of 86% for English as Second Language (ESL) practitioners and 99%+ for native/near native speakers of English. Well, I guess the debate hasn't settled then :) But it's okay. I'm glad I started this thread and getting to learn more from you and other experts. I'll still keep the original post the way it is for now. I think ADM was dropped from PMBOK Guide, 4th Edition because I remember I remember seeing it on the 3rd Edition when I took the exam. But I could be wrong on that. P.S. I'm glad to hear that you liked the new look too. It took me about a week to redesign it, primarily because I'm not a web designer and had to toil my way through. But at the end, it was a satisfying and good learning experience. Page load speed was another important aspect that was addressed. Now I hope I keep posting useful content more often. I'm still confused. I've seen BOTH ADM & PDM in questions. Granted some questions might have been from out of date exams, but I'm grabbing any info I can get. I would HOPE that the question on the exam would specify which to use. How you co-relates activity versus tasks in project management. I was disappointed that I had to read to the end of the article to get the answer. I would have preferred the correct answer be stated at the top to save my time; as well as that of whoever else found themselves drawn here. The icing on that cake turns out to be that the article's conclusion is wrong anyway. Thankfully, I read into the comments to find that out. From Mr. Harwinder's response to his commentors, it turns out he is loath to rescind his erroneous conclusion or ammend his article. It seems Mr. Harwinder is more interested in reveling in the controversy than settling it; and it appears the real purpose of this article is to perpetuate it. You said a lot about me and my intent, but you didn't say a word about what you found wrong with the article, or what your opinion on the subject is. That makes me question your own intent. So my suggestion to you is to be constructive in your criticism. Instead of indulging in personal attacks, try to focus on the topic. Great article. Thanks for explaining. Pg 177 Figure 6-18--Added the following clarifying the note to the figure. This example uses the accepted convention of the project starting on day 1 for calculating calendar start and finish dates. There are other accepted conventions that may be used. Nice article! Good approach to explain the difference between the ADM(clock starts at 0) and PDM (clock starts at 1). But - to avoid any further arguments and confusion to the topic, it would be great if the section that "declares the clear winner" is modified or deleted altogether. Personally, while understanding the concept myself and explaining others-the PDM method,that starts with Day 1 was preferred by me. 2. Furthermore, if you look at it from a practical approach, our calendars start from Day 1. Don't really see a "Day 0" in our calendars-do we? 3. PMBOK version 5,page 177 (figure 6-18) CPM example also takes start date as day 1 and mentions it as an accepted convention. In the same figure,the foot-note also says that there are other conventions to express the start date. Since PMI itself is avoiding to prefer any given method(between PDM and ADM), it would be better if the publisher can modify the blog to avoid confusions on this topic. Thanks for pointing it out. The note on figure 6-18 of PMBOK Guide, 5th Edition still validates both approaches. Biswa - I have striked out the original conclusion and added a note. Thanks for your feedback! The debate continues. "A User's Manual to the PMBOK Guide" (updated for the 5th Edition PMBOK) which is published as a companion for the PMBOK uses the starts at zero. Thanks for sharing that info, Shari. However, I would like to note that the user's manual is not an office PMI document. For now I'll stay with Approach 2, which is what is used in the PMBOK Guide, 5th Edition. Hope PMBOK Guide, 6th Edition comes out with more clarity on this topic. Thanks again for your contribution to this page. Thanks for yours clarification on both approaches, what if the duration in weeks instead of the days. I don’t think we can use 2nd approach while duration is describe in weeks. Please explain. What if you were given just an activity node with ES and EF or LS and LF and were asked to calculate the Duration. Which of the two methods would you use? I ask this because, in that case the calculation of duration (EF-ES) would be different for both methods. I would really like your feedback on this. Thanks again for the blog!